1:50 p.m., April 2, 2003--Scientists from the University of Delaware have made a major breakthrough in terahertz nanotechnology, one that could have practical applications in medical imaging, hazardous materials detection and even rescue operations. The research team has discovered a way to harness the power of the terahertz frequencies in a palm-sized device using a semiconductor nanostructure, according to James Kolodzey, UD professor of electrical and computer engineering. Terahertz is the final frontier in the study of electromagnetic waves, Kolodzey said, and in the frequency spectrum it lies between microwaves and infrared light. It is 1,000 times higher in frequency than microwaves, which are used in cell phones and ovens, and 100 to 1,000 times lower than visible light. Not much is known about the terahertz frequencies, Kolodzey said, and the groups research is both in basic science and in practical applications. It is known that the frequencies are strongly absorbed by the atmosphere, which makes terahertz a poor medium for long distance communication through the air, which is how the microwave frequencies are used. However, terahertz is of great value at closer ranges. For instance, Kolodzey said, it can be used to detect chemical compounds, such as pollutants. Also, it is sensitive to molecules and, to the researchers surprise, can pass through solid materials and so can be used in imaging and scanning. In that way, it is like X-rays except that it is not believed to be at all harmful to humans. 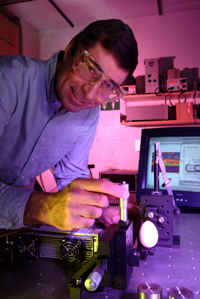 The ability to scan through solid materials is a unique and new terahertz operating principle that has not been explored, Kolodzey said. To date, the UD researchers have scanned a paper clip through a silicon wafer and have looked at the interior of an egg by scanning through the shell. 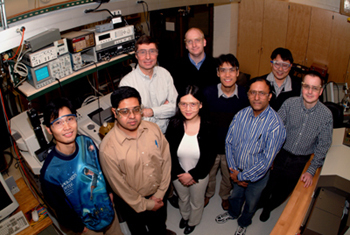 The terahertz nanotechnology research team includes (left to right): Guangchi Xuan, research assistant; Suddhasatwa Ghosh, research assistant; James Kolodzey, professor of electrical and computer engineering; Xin Zhang, research assistant; Thomas Adam, research assistant; Pengcheng Lv, research assistant; Samit Ray, postdoctoral fellow; Sangcheol Kim, graduate student; and Thomas Troeger, research assistant. Kolodzey said he is excited about the potential uses for the new nanotechnology, particularly in the medical field where it could be used to scan for diseases, such as cancer, the cells of which have a vibrant terahertz signature. It also could provide dentists a tool in addition to X-rays and has applications in the field by providing rescuers a device that could detect victims trapped under tons of rubble and emergency and environmental personnel a tool for stand-off detection of hazardous materials. And, all this in a hand-held device, not a room-sized piece of machinery. Our goal is to make it usable and affordable, Kolodzey said. The devices are based on a silicon germanium semiconductor, Kolodzey said, adding that UD is one of the primary centers for the study of this medium in the world. The semiconductor is used to select energy bands that relate to terahertz and filters are added to control the frequency more precisely, at our will, not natures, Kolodzey said. A waveguide is used to corral and distribute the signal in the manner of a laser pointer, except one with unique powers. Kolodzey will give a presentation on the research groups finding during the 11th International Symposium on Nanostructures to be held June 23-28 in St. Petersburg, Russia. Also, he has been invited to speak at two events sponsored by the Institute of Electrical and Electronics Engineers (IEEE). The first, the fourth IEEE Topical Meeting on Silicon Monolithic Integrated Circuits in RF Systems, will be held April 9-11 in Grainau, Germany. The second, a workshop on optical technologies for medical applications, will be part of the IEEE International Microwave Symposium to be held June 8-13 in Philadelphia. The research is funded by the National Science Foundation, the Defense Advanced Research Projects Agency (DARPA) and the U.S. Air Force.